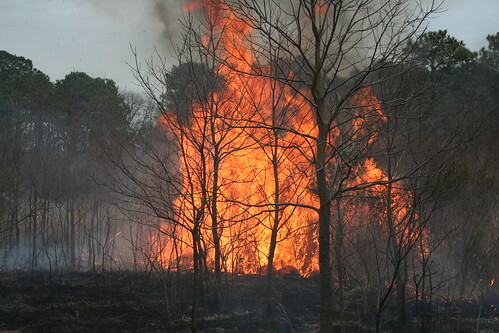 Spring wildfire season has begun in Maryland, and the Maryland Department of Natural Resources urges residents across Maryland to prepare and help prevent wildfires. These factors can turn small fires into dangerous incidents that can threaten lives, property and natural resources. On days when this threat is most likely, the department will issue “red flag” status. Each year, the Maryland Forest Service responds to an average of 200 wildfires that burn 2,200 acres of forest, brush and grasses. The leading cause of wildfires in Maryland is burning of debris or any kind of outdoor burning, which accounts for 29 percent of fires in the state. Lightning is the only natural source of fire ignition, but accounts for less than 5 percent of fire starts. The Maryland Forest Service recommends alternatives that are safer and more environmentally friendly than outdoor debris burning — including composting or mulching of yard waste, leaves and brush, and using larger brush or trees for firewood. Outdoor burning should only be done on low fire danger days. State regulations apply to activities in woodland and within 200 feet of woodland, or activities adjacent to or within an area where flammable are located. Burning occurs between the hours of 4 p.m. and midnight unless the ground is covered with snow. Residents should check with their county or municipal health department for local regulations and permit requirements before burning. More information on open air burning is available online.